Export-only and later version of the APM-66ES with puzzling cone and aluminium dome for the mid and high drivers, this corresponds to the "Type 2" in the service 1986 manual. The original japanese APM-66ES (black) had its b-r port vertical next to the mid driver, the USA equivalent (wood) had it there too, the EU equivalent (black or wood) was a sealed design... and this ESG version brings its b-r port back where it was on all original APMs : under the woofer ! The woofer however is very different than that of the APM-77 : there is only one motor, linked to the flat diaphragm with eight damped tubular sticks. So the 66ES is a halfway between the more conventional Technics honeycombs and the real APMs. All diecast frames nevertheless. It also adds two front pots, which the previous EU APM-66ES models didn't have (but the USA did). And the enclosure isn't as tall, is less wide and less deep. Some marketing exec's really wander around, sometimes. Engineers, too. I just took delivery yesterday of a pair of APM-66ESmkIIs I got off eBay for a snip. The seller set a BiN price of £150 and these are far and away the best condition pair I've yet seen on eBay, and the first pair of '66s with *mint* drivers - not a mark on them! I got the original stands too, the first time I've seen them for sale for the 66s. I'm really very pleased with this even if I got bilked on the delivery charges (dispute ongoing as of this post). They are bigger and heavier than I imagined, and when set up on the stands, really VERY imposing speakers indeed, physically. They really dominate the room. As pleased as I am with them, I'm really rather tempted to keep them on the floor when I set them up at home. The wood finish has a few light scrapes, marks and scratches but nothing particularly noticeable and all should be restorable with care and skill (which skill I don't have...). The wood itself I am a bit disappointed with, the pics you see on TVK and all over GIS seem to be of samples with much nicer wood/graining. These look a bit ...drab =/ I've been absolutely drooling over a couple of beautiful pairs of SS-G55s on Yahoo recently and I wish these APMs could have had half as nice a finish! The stands are even more odd. The top and bottom plates appear to be of some kind of wood composite that is somewhere between a coarse MDF and a very fine particle board, much as you'd see many old/cheap speaker cabs made from. The edges are clean and sharp but there's no decoration or trim or veneer or anything, just a matte black painted (sprayed?) finish. Really very cheap looking, not what I expected from what I assume is still on the premium side of the APM range (or am I wrong in that expectation?) The column, whilst still of the same material, has rounded edges and was clearly custom made and looks and feels much better. And you can't even really see it. 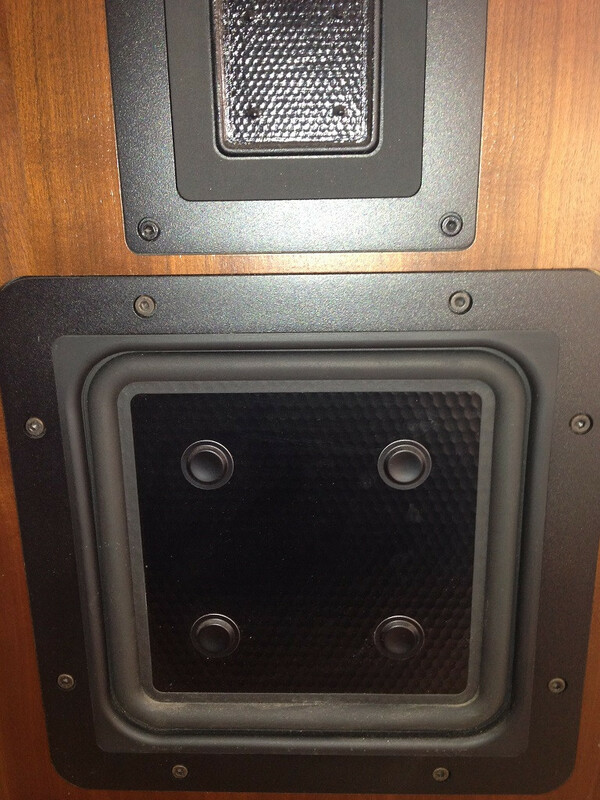 There is a small hole near the front of the top panel on the stands, and it matches a small hole in the base of the speakers. I assume originally there would have been some kind of pin that located in these holes to stop these big (and heavy!) 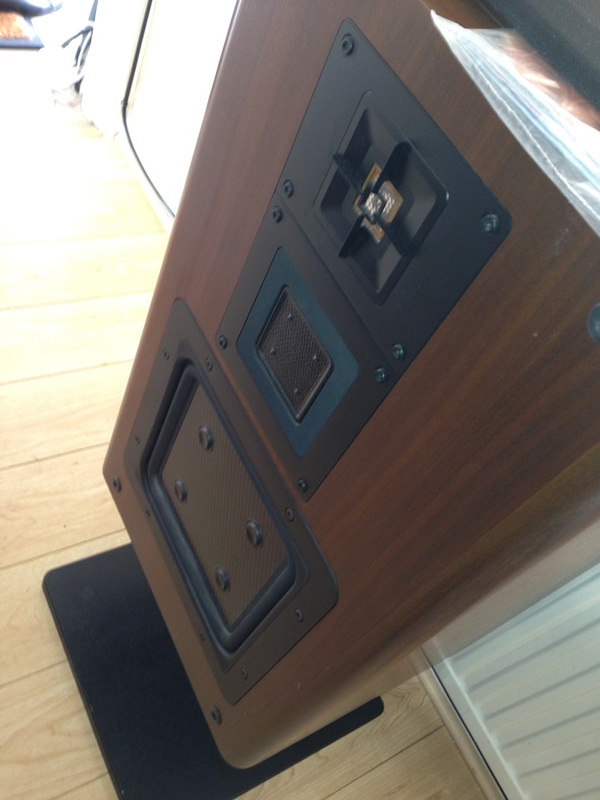 speakers from sliding off, and for allowing them to be neatly rotated/toed-in a bit if desired? I will have to ask the seller, but he's not talking to me right now. So, having set them up yesterday at my mum's house (nowhere to put them at home at the moment... ) today I went over with some speaker cables and hooked them up to my mum's AVR. Finally to hear what these great APMs are all about. I admit I was nervous, half-expecting a blown driver or nasty buzzy sound or some kind of sonic nasty. But no, just great music came out. The sound could be quickly characterised as dynamic and clear and surprisingly 'free' from the box, but with a forward balance to the sound. Indeed - and much to my disappointment - I found the bass rather lacking, and even after I disabled the sub on the AVR and put it in 'direct' mode they weren't really kicking out the bass. It was there, but it was lean - the whole sound had this forward balance. For now, I blame the AVR and the BR player and I will have to get a decent amp and try again soon. Alas right now I don't even own a decent amp, the nearest being a Marantz PM64 with some very noisy switches. 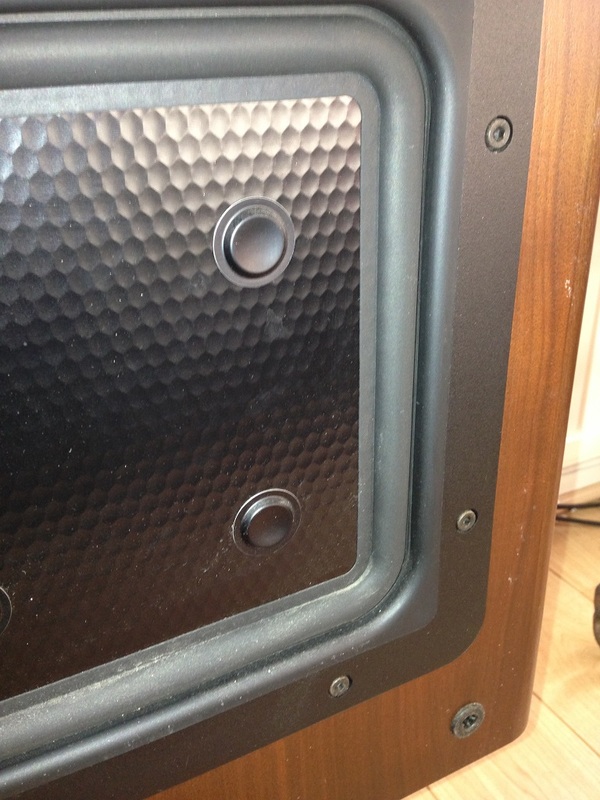 I'm terrified an unwanted pop or click or something will kill my lovely old speakers. 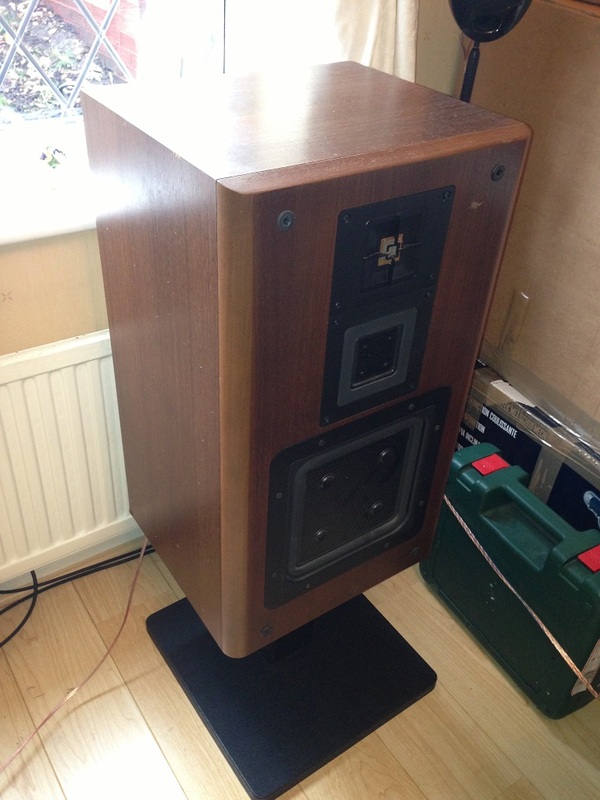 Now, my big question, am I not right in expecting that the big APM speakers can, do and will produce great bass? and shouldn't they have a more natural sound balance? I will do what I can to get the best out of these speakers but I have to be honest, first impressions are a bit disappointing. Can anyone tell me how these compare to the '77s, '4s and '6s? I defintely aspire to own a pair of APM-6s (don't we all?) 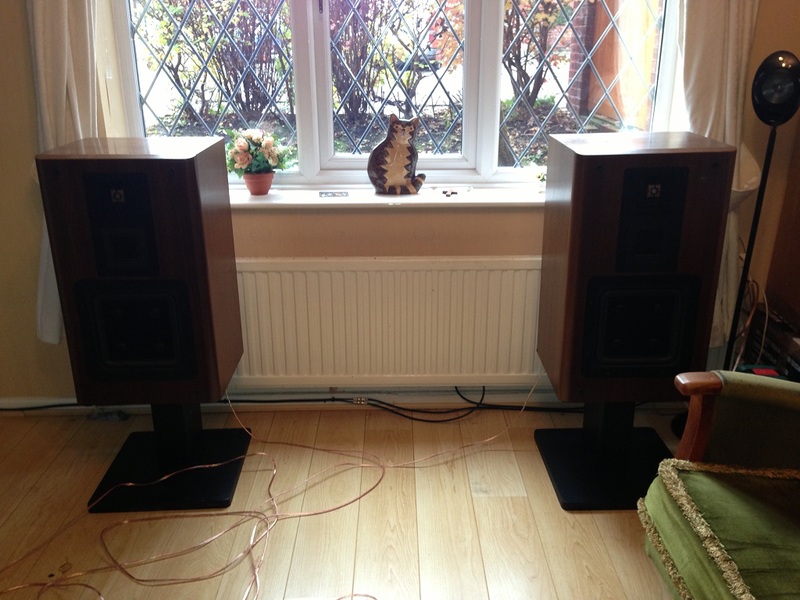 and a pair of APM-4s (again, don't we all!) but whilst I'll deffo grab a pair of '77s if I can, they aren't on my permanent wish list, just a stepping stone to the '4s and '6s. I'm sure y'all 'd love to see some pics but my iPhone shots today were all washed out/over-exposed (the speakers are right under a window right now) so I probably will not be able to take proper shots till they are set up at home. And if I don't report back again... s'aright, just means the wife has killed me! Nice find! This is actually very interesting, I had no idea they ever made APMs with black drivers. It looks like these may have been a Europe only model? One of the few pairs I found pictures of online said "Made in W Germany" on the label. I've only ever heard these speakers without intact surrounds so I can't comment very well on the sound. I can think of two possible reasons they may have been lacking bass though. One is that someone has replaced the surrounds with an inappropriate material. Of all the pairs of APMs I've seen not one has had original intact surrounds, but I have heard that certain models had more resilient versions. I think Axel or Ozzy have more experience in this area. The other more likely possibility is that they need an amp that can deliver more current. If the APM66 is anything like my 777ES it has a complex crossover with some impedance dips. The 777s sounded pretty anemic on a Yamaha CA-2000, which is actually a great amp. I suggest you try them out on an amp that's stable at four or even two ohms. Thanks, it probably is the amp - it's a cheap 50Wpc AVR that's bottom of the range and two generations old by now. It's fine for my mum's Kef 'Eggs' but definitely not for these speakers. I hadn't considered that the crossover might be sapping the power but it's certainly possible. Romain has all items discussed (33 /55 /77 /66 /4 /6 /8) and has restored many of each so he knows better. As noted on the TVK page, the 66 was produced in many versions : it was the last "full-size" APM and the end of the road for Sony's ambitions regarding APMs. The EU models were indeed assembled (and sometimes modded) by Sony SDL and are probably quite different than the US version(s) or the Japanese original (no mkII or III in Japan). It sold very well in Japan. You shouldn't be low on bass, never : tired caps in the filter or something else. Remember the APMs have to be used very close to the back wall : a few centimeters away, no more. WS Stands were pretty much made all alike : not that pretty but very efficient and stable. 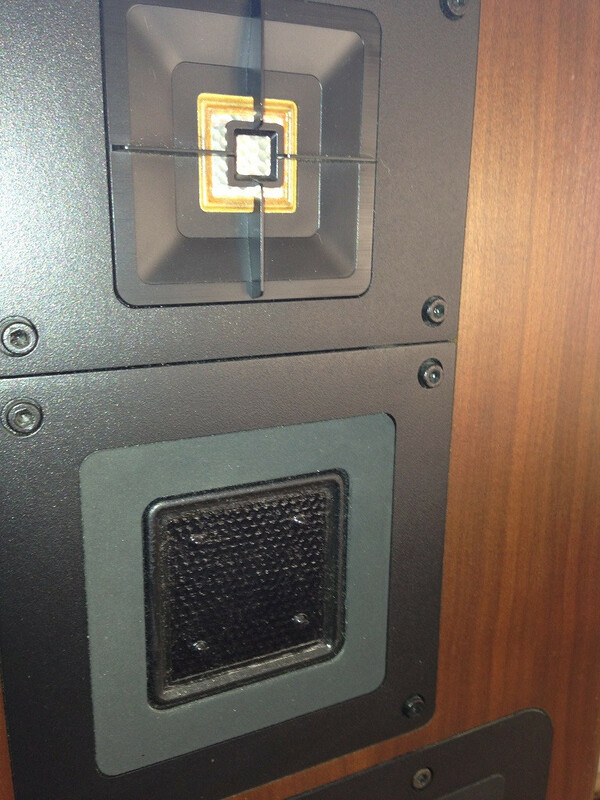 They are fixed to the base of the enclosures with a long (long) screw. My 77s are very well driven with a small TA-N86B in Class A ; that's 2x 18W only and not that much current either ! PM-95 : go for it ! In it also is an entire dual TDA1541A S1 d/a section, too, so anything with a proper and clean digital circuitry (and output stage) will sound like a CD-95 ! I have to agree with Axel, my 77's are not short on bass at all. I haven't played them in quite a while as the surrounds only exist as a visual item and are ready to be blown into oblivion with the slightest movement. But when I got them I found them to be very balanced, pleasing and certainly not lacking in bass. Tried them with a TA-N7B, TA-F7B, TA-N900's, TA-N88B and TA-N86B's. I have a STR-DB840QS that sounds great with movies, but stereo/direct mode with any speaker is rather lousy and bass-shy, so reading your story I would also believe that's your problem right there. 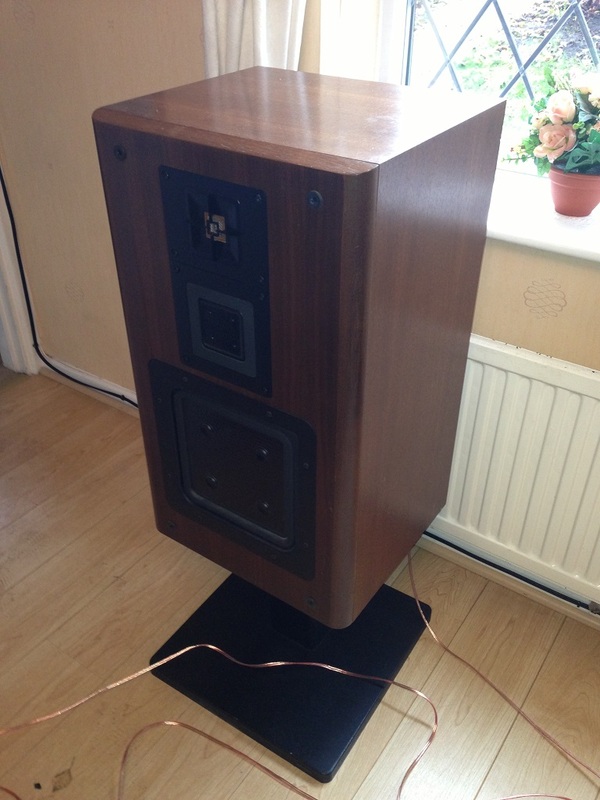 The surrounds on these look in very good condition - could they be replacements? How would I tell? I will try and remember to take some better pics tomorrow. I was under the impression that the APM-66's had rubber surrounds instead of the foamy stuff that the 8-6-4 and 77's had so they might be original. Hmmm they do feel rubbery, although very soft and compliant. I've got some pics ready to post - apologies if they are too big, and apologies too because I haven't dusted the speakers yet lol! They are definitely not the best one, the woofer is the less motorized of all the series actually, but they are good. 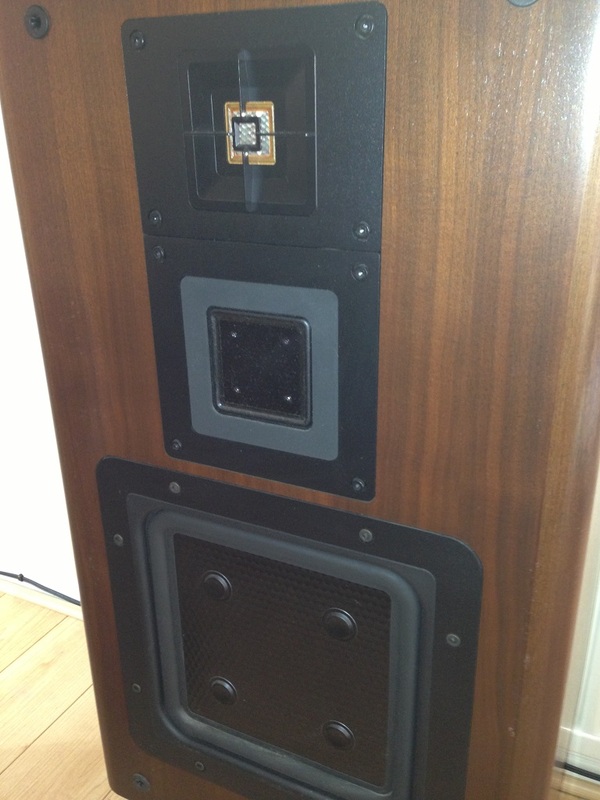 One could sometimes find my SS-A5 speakers to have more bass than my APM-8... But in fact the bass quality of the APM is far above the A5. They have so much more nuances and they are not colored. 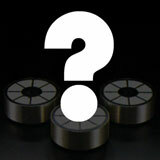 It is because APM technology has no cavity effect. This effect is due to the conus of regular woofer diaphragms. I think you just miss this cavity effect. Just listen real instruments and think that you are listening real instruments, not music, a good drum play for example (maybe Sheffield Lab, Drum and Track) and you will listen plenty of good bass. (You can also try Joel Grare, Paris Istambul Shanghai, plenty of tracks with good bass on this CD). Also, Axel noticed well, they must be well placed in the room. As close as possible from the back wall, 30cm minimum from the side wall, about 2m max between them. I would say 3 to 5cm angle from the back wall. And of course keep them on their feet. The filters have also to be restored. Speaking of servicing, you mention the filter needs restoring - I take it I have to remove that via the front by removing the bass drivers first. Then is it just a case of re-capping them, or what else do I need to do? Can I test them first to see if they actually do need restoring? As a collector I do prefer to keep things in original condition where possible, but of course there's little value in maintaining faulty parts obviously! Have you checked the polarity of the loudspeaker cables? Sorry, if I ask the obvious but it is a common mistake and happens easiely when using cables which are not marked properly.